Modern radiative heating systems in commercial buildings are very sophisticated systems involving precision components and specialized equipment. The boiler can be said to be the ‘powerhouse’ of it all, as it is responsible for heating the water that is distributed throughout the network of pipes and appliances. Reduced efficiency. When a commercial boiler is forced to operate with clogged pipes, suboptimal water pH, or compromised electronics, the result is less heat being distributed to the end appliances. Efficiency is almost always improved with regularly scheduled commercial boiler maintenance from Front Range HVAC. Pressure or water leaks. If you’re noticing your commercial boiler leaking water or emitting pressurized air during operation, there could be a serious problem that needs addressing immediately. Water leaks, in particular, can cause ongoing damage in the form of rot, mold, and premature structural breakdown. Corroded pipes, fittings, or connections. It’s a fact: given enough time, even the hardiest metals will corrode, especially when there’s water exposure involved. To address this, have the commercial boiler maintenance professionals at Front Range HVAC perform the maintenance required to keep your boiler in tip-top operating condition. 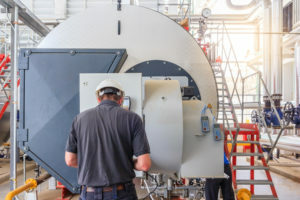 The benefits of having routine boiler maintenance performed on your commercial boiler include more reliable operation, lower cost of ownership, and more consistent heating throughout your building. Winters in Colorado can be downright frigid. With Front Range HVAC in your corner, you don’t have to worry about whether or not your boiler is going to go out. Because we hire only the best-trained technicians and use industry-leading tools and repair equipment, you can rest easy knowing your boiler is in the hands of proven professionals who know exactly what they’re doing. Not sure if your commercial boiler needs maintenance? Or, is it time to have it evaluated for repairs or replacement? Find out with a quick call to the commercial boiler experts. Front Range HVAC is your sole source for sales, service, and installation of commercial boilers. We can work with boilers of any size, manufacturer, and style. To schedule an on-site evaluation of your commercial boiler, or for more information, call us at (303) 942-1372. We look forward to hearing from you!